The Hawk and Wreath is a surprisingly large establishment, given its unassuming purpose. Constructed from stone, mortar, and heavy wooden beams, the Hawk and Wreath is a two story building covering a considerable area. The inn serves as a source of rest and comfort to visitors and residents of Stonedale alike. Customers are welcomed at any hour, and no living resident can remember the last time the inn closed its doors. In a world as grim as Erdeor, the jovial sounds of fellowship from within serve as a beacon to the hungry and weary. The Hawk and Wreath Inn had its normal rustle and bustle about it as Cam and his brother, Nicolas, neared the building. Man, beast and creature alike entered and exited the place as they pleased. No one was stopping them. There was a small wooden sign outside the building, held up by a single stake. Etched and painted on it was a single word, "Hawk and Wreath." This was the Inn of Stonedale. As Cam and Nicolas neared the building, they were able to make out a group that had gathered outside. A group of nothing more than peasants. At the center of the group was a single character of Human descent. He stood on a wooden crate to elevate himself above the crowd and allow his voice to carry over them. But, what was this man doing? Was he ranting and trying to rally the people of Stonedale for some cause? There was no way to be sure, but nevertheless, Cam felt obligated to check things out there. The crowd was only growing in numbers. Nicolas then turned to Cam and spoke, his voice slightly higher in pitch than his brother's. "What do you think is going on there, Cam? It doesn't look like it could be anything overwhelmingly good." Cam looked back to his brother, a look of concern on his face. He didn't know exactly what was going on and had seen these things quickly escalate into violent riots before. What would start out as a noble cause always seemed to find a way to become violent. Find a way to turn to aggression. The truth was it was as simple as something known a group polarization. Just has mobs and gangs, the group's views were more radical than each individual in it. These gatherings did not stray from that. As more people would gather, the group's overall outlook would grow even more radical and it should be stopped while it still could be. Cam had no intention of letting this grow into a violent mob. "Nick, I'm not exactly sure of the exact circumstances of what is going on here. Listen. Just go into the Tavern and find us both a table. If the waiting staff comes to you before I make it inside, just order me a water. I'll get to the bottom of whatever is going on here." Nicolas looked to his brother again, peering deep into his eyes. He could see the worry in his eyes. It wasn't hidden. For this reason, Nicolas began to worry for his brother. He had no desire of seeing injury, or harm of any kind, come to his brother. And just as he didn't want to see it, he didn't want to hear about it either. "Cam, I'm worried that this won't end well. I love you and would hate for anything to harm you. You are truly the one person I am closest to. Even closer than Mother. Before I head into the Hawk and Wreath, just promise me this one thing. Promise that I want end up hearing that any form of harm has come to you." Cam looked to his brother, allowing a comforting smile to come across his face. He put his right up to the left side of Nicolas' face, letting his hand lie gently on Nicolas' cheek. "Nick, you have nothing to worry about. I think I can handle myself, but if some course of violence erupts, I can promise you that you'll be able to hear it from within the confines of the Tavern and be able to quickly rush in to aid me." He leaned forward now and let his hand move from Nicolas' left cheek to behind his head and pulled him in close, kissing the top of his head; then he let go. "Stop worrying about me, Nick. I'll be just fine." Cam then switched his tone to a joking and humorous one. "Now get your tail in that Inn to claim us a table before they all get taken. It is time for the lunch rush now as it is anyway." With that, Nicolas turned from Cam and headed into the crowded Inn. It took him a little while, but he finally came upon a place to be seated, a booth in the back, right-hand corner. Within seconds, a waitress came where he was seated. Rather good service for a day that seemed to be overly busy. Nevertheless, someone was already there to get his order. The Waitress was a Human woman with a dark auburn hair color and bright green eyes. She looked to be about five feet and four inches tall with a slender build and in her early twenties or even late teens. The outfit she wore was a black and gray dress with an accent of green. Nicolas found this woman very beautiful, but had no intentions of claiming a "love at first sight" scenario. He wouldn't allow himself to believe in such old wise tales. The waitress turned to him and spoke, her voice both sweet and soft. Sir? What can I start you off with? A drink of some sort? Nicolas looked up to her, his eyes meeting with hers and spoke. "Could I please get two waters, ma'am? One for myself and one for my brother who should be arriving shortly." "Sure thing, sir. That is no problem. I shall return shortly with both." ". . . It's time we finally stand up for ourselves, my good people. We stand up to this hierarchy. My good people, my friends and neighbors, let us take on a life of freedom. A life of independence, for what is better than to be able to live our lives without a figure that tries control us?" Cam listened to the man as he went on, his ideas only getting ever more radical with each line he spoke. He stayed his tongue though and let the man go on. he desired to hear more of what the man had to say. He sure wasn't afraid to say whatever was on his mind, even if it could be considered treason. "I propose to you, the good people of Stonedale, we rid this place of government control. Of this mentality that one man is born and/or made better than another." Cam had heard enough now. The man was proposing to throw out government all together. He wanted anarchy and anarchy simply would do nothing more that cause an unending chaos among Stonedale's population. He must be silenced of this foolishness. "Good Sir. What you are proposing is preposterous. Anarchy will never work. It is as simple as the fact that when people, beasts and creatures alike, all of which are social beings, live together, it is imperative that they have a way to make collective decisions. No matter what one says to this, any form of coming together to make these collective decisions is, in itself, a form of government. So, good sir, I suggest you change your attitude toward this subject before you leave me no other action than to enforce my authority here and have you arrested. Believe me, I do not want it to come to that." The man looked at Cam, surprised by what he said. He was ignorant, however, and just brushed Cam's statement aside and instead of actually taking heed of what Cam had actually said, jolted back with a comment of his own. "Well then please tell me, noble paladin, is the function of our government that has been instated here not to maintain order, provide public goods and to provide and protect equality of opportunity? I do not believe they have done a very good job of that and I imagine there are many others that have the same stance that I do." Cam simply shook his head before replying to the man. "I did not come here to volley insults back and forth with you, good sir. And to answer your question, yes our form of government here is doing what they were set up to do very well. Not everyone can live a wealthy life and a life of nobility. It is simply impossible. Now I ask you one final time to stop with this ranting of non-sense or I will have you arrested. Not as a violation of any freedoms that you possess, but as an act to protect the people of Stonedale. You actions, if continued, could and will lead to harm coming to a great many people and I can not allow that to happen. So, step down, good sir." The man glared in Cam's direction before he stepped down from the wooden crate. When he approached Cam to speak face to face with him, he stopped when just five paces away. He then spoke. "You have won today, paladin. I have a feeling our paths will cross again in the future. Have a good day then." Cam discarded the backhanded comment and then turned toward the tavern and walked in its direction. Cam continued into the Inn and spotted his brother in the back, right-hand corner and approached him, sitting down at the table when he got there. Just as he sat down, the waitress approached the table with their drinks, both waters. She carried them out on a circular tray carried with her left arm and she used he right hand to place each wooden cup filled with water in front of both men. "Here you go. Can I help you to anything to eat today, sirs?" Cam looked to the waitress and then spoke. "Ah yes. Can I get soup please?" "Yes you can, sir. Just the soup of the day?" "Yes, ma'am. That is fine." "Okay, then. And for you sir?" "Okay, then. I'll have it our for you shortly then." Nicolas waited for the waitress to leave before he decided to ask Cam about what was going on outside. He was happy to see that no harm had come to Cam, but his curiosity was taking over. He wanted to know just what was going on. So? What was that all about, Cam?" Cam didn't want to think about what had gone on outside. It bothered him that someone was actually trying to rally people into "ridding Arnor of all government". He decided that he wouldn't tell him about it just yet. Maybe later. "I'll say later, Nick. But for a change of topic, I see where those eyes of yours are gazing. You're single. You're a tough brute. I bet you could get her if you wanted. Eh?" Nicolas began to blush as his brother had actually noticed that his eyes had been glued to the waitress for the majority of the time. He had never been in a relationship like Cam had been in, in the past. He didn't know how to go about certain things, including affectionate emotions. But, what surprised him the most was that Cam was encouraging him to try and get to know her more. Nicolas drew back at the question from his brother, Cam. It was certainly something he had not expected to come from his brother's mouth. It was all good though as he knew his brother only joked with him in this manner. The love between them was great and their brotherly love for one another deserved recognition. Nicolas turned his gaze back to the waitress once more. It was only brief this time as he drew his attention back to his brother as he gathered in his mind exactly how he would reply to his brother. Taking a deep breath in, he shook his head gingerly then began to speak. "You would say that, wouldn't you? You won't just let me observe from a distance, will ya?" Cam sat back and chuckled a bit at his brother's reply. His brother was at an age where he could actually begin thinking about a long-term relationship and not just shirt crushes. However, there was something else behind this. Cam knew exactly who the waitress was and had met her in the past. He knew her family very well, especially her brother. "Hey! I just think she might be a good catch for you, bud. She is there. All you need do is cast you reel." "I don't know, man. I don't anything about her other than she is a waitress here. Is it really a good idea to jump in based on someone's appeal?" "Stop being so timid, Nick. Follow this emotion of yours. Court yourself a woman and develop yourself a loving relationship with her. Later, take your vow to be with her for as long as you both may live and have yourselves some loving children. You need such love in your life." Nicolas turned his head toward the heavens, allowing himself to visualize such a future. It seemed to be a great thing, but if it were so great, why had Cam not yet courted and wedded a woman yet? It didn't make sense to him. He didn't understand why exactly his brother was telling him this when he, himself, had no such love in his life. "If that is the case, why do you not have such a love in your life, Cam? Why would you tell me that I need such a love in my life when you don't have such a love in your life? You seem just fine to me." Cam shook his head in disappointment. His disappointment was not with Nicolas, but with himself. He had had such a love in his life before, but had never told his brother. It was a hard topic to approach. They had planned to marry in the future, but circumstances arose and did not allow this to happen. "Nick. I have never told anyone what I am about to tell you. Never, but the truth of the matter is that I have had such a love in my life and I know just how vital such a love is." This caught Nicolas completely off guard. He had always thought that his brother had shared everything with him. They were extremely close after all. Apparently it was not so, though. Cam had been keeping this from him and it looked like just thinking about the "love" he had had in his life was causing him heartache. He didn't want his brother to be sad or anything, but he wanted Cam to tell him. He thought that talking about it may serve as beneficial to Cam in the long run. He felt it needed to be done and not held in repression any longer. "Cam? Why have you never told me of this before? Won't suppressing such memories lead to something terrible in the future? We need to talk about this. I believe it to be imperative for your well being." Cam tucked his chin to his chest now and closed his eyes tightly, trying to fight back the tears, but he knew that his brother was right with this. Trying to suppress his past wasn't doing anything good for him. If anything, it was causing him harm. "I am sorry I have never spoken of it before, Nick. It was and is very painful to even give a thought to. However, it is time I finally said something about it. It was about four years after I had enlisted in Stonedale's army that I, myself, met a very beautiful woman. Just as I had noticed her in such a manner, she noticed me. It was truly "love at first sight". Her name was Rachel. We began to cultivate a truly marvelous relationship with one another, but I kept it from the ears of my family. Later we had vowed to one another that we were going to get married and be the light of each others lives, but it seemed the Gods had a different plan. Perhaps, she had lived her life to their favor and they just wanted to welcome her to a better life, perhaps not. The fact was that when she went out to harvest some wild berries in the forest, a group of goblins attacked her. The next morning, I was out on a routine patrol and that is when I found her mutilated body. And, with that, I hunted down those mangy beasts that took the love of my life away from me and I killed them all. All of them. I had let my rage take over and for some reason at the time, it felt good to me, but now, in the present, I don't feel any better about it. I did nothing to honor Stonedale or protect it. All I had done was go into a fit of rage and killed those that had killed Rachel. To this day, I have never fought out of such rage and instead have vowed to never do so again. If I do, I pray that the Gods take me out of this world and have me cast into the Ethereal Planes. I will not fight out of rage again." Nicolas let his head hang low now. He had never known that part of his brother. He had only known his brother as kind and loving toward all. One who pushed himself to act solely on the aspects of both honor and duty. Never had he known his brother to act out of rage and hatred. Not even toward those who had taken the life of their father even though that had been in a battle. "Cam, I am so sorry that that aspect of your past was brought up here. I shouldn't have asked in this place and I apologize for doing so. Is there anyway I can help you to cope?" "No. You're fine, Nick. I am actually glad you asked me to tell because after I spoke of it, even though it was quite painful, I feel better. I feel as though I can actually move on now. Perhaps, I can even find myself involved in another relationship in the future. You have nothing to make up for. It is I who should be asking what I can do to thank you for helping me. Not the other way around." "Cam. There is no way you can do anything more for me than you have been doing already. I am thankful that I have you as both a brother and a dear friend to count on." Cam shook himself free of the hurt now, gathering himself again. What had just transpired was good and he knew it was so. It may have hurt, but it was going to let him move on. However, no matter how helpful what he had just undergone was to his wellness, he desired and change in topic as shedding tears in public didn't go well with him; he simply didn't like it. It put him in a position of social awkwardness and even embarrassment. Cam leaned forward, resting his arms on the table now and forced a smile on his face. "Everything is fine now, brother. Let us return to our previous state of discussion and I will remember to explain to you what happened outside there." Nicolas looked to his brother again, leisurely slumping down in the wooden booth seat. It amazed him just how well his brother was able to keep in a cheerful manner. How well he was able to regain his composure and appear as a chipper fellow among the many. He wished that he could be like Cam in this manner. Nicolas was ready to move on as well and didn't put a second thought towards what had just been discussed. "I look forward to hearing of what did happen outside. It didn't take you long at all to do what you thought needed to be done. Anyways, what was it that we were talking about before this?" "You and your pull toward a certain someone. Who was it again? Oh, yeah. Our waitress." Cam's tone had returned to its prior state of cheerfulness and humor. "Yeah, that's right. So are you certain that she might be the one for me?" "Nick. You've got this. Now cast the reel." "Alright, but I doubt I'll be any good." The waitress made her way back to the table where Cam and Nicolas were seated. She had made it back just in time to catch the last bit of what Nicolas had said and decided she would say something about it. It would be in a joking manner. "Be any good at what? I imagine you are good at a great many things." She proceeded to placing the soups in front of the men then returned to an upright posture, holding the tray against her hip, waiting for a reply. She had a smile on her face and held herself in a confident manner. Nicolas was not expecting the waitress to say anything. He didn't even know that she had returned, but she was there. He inferred now that she had mostly likely heard that last little bit even though she really hadn't. The nerves began to overtake him now and he took in a deep swallow, swallowing the saliva in his mouth as he did so. He was finally able to reclaim his conscious mind now as he shook off the waitress' statement. Meanwhile, Cam proceed to grab the wooden spoon with his right hand and get a spoonful of the hot liquid, the steam wafting upward. He held it there above the bowl for a moment letting it cool down a bit. As his brother spoke, Cam couldn't help but let out dampened chuckle, dampened to a point where only if one was listening acutely for it or looking at him as he did so could take notice to it. As the smile creased over his face, he pulled the spoon to his lips and blew on it briefly, cooling it down a bit more before he put it into he mouth. When the wooden spoon emerged from his mouth, he put back into the soup and grabbed the small towel and wiped his mouth with it. There was a small metallic clank that resounded briefly as Nicolas kicked Cam's left shin guard with his right boot, but no one gave the sound any mind, not even Cam. Cam looked up to the waitress then glanced back at Nicolas, not turning his head to face Nicolas, before returning his gaze back to the waitress. "The soup's good. Give my regards to the chef, please." Cam returned his gaze to its previous position, back down to his soup as he picked up the wooden spoon once again. He then proceeded to get another spoonful of the hot soup. "Will do, sir. I am happy that you are enjoying it." "So, my friend, are you gonna give me a real answer or am I stuck with that?" Nicolas was confused. He thought he had given her a real answer and as he thought she had heard most of it, didn't really think she actually needed as answer. However, maybe she hadn't heard all that he thought she and that was why she asked. "Well, here goes nothing, then"
"I don't know exactly how to put it, but I find you . . . well . . . "
"Um . . . how do I put this? Well . . . Um . . . I would like to get to know you better." Cam went to think to himself. "Well, I've seen worse, but I really hope Rachel's sister, here, thinks the same way of Nick. I really don't want Nick to end up looking like a goof. "Aw, that's sweet. I'm not exactly sure what to say other than just come visit me here more often if you want to get to know me better." "Let me see your hand, please." He lifted his left arm and extended it toward her, confused as to what she was actually doing. "Keep me close to you until our paths cross once more. Allow this to be a token of us and our friendship that is more than a friendship. Let this represent me when I am not with you." She spoke these words as she wound a deep purple ribbon around his left wrist and tied it there. She gave him a loving smile. "My name is Erika, by the way. May I have the name of the lovely man who courts me?" Nicolas blushed as she went though with the action she was taking. He had thought there was no way that she would give herself so willingly to him. The again, he didn't know her like his brother did. He didn't even know that his brother knew her at all. With that, she curtsied and returned to the bar area to attend others that she was waiting on. Nicolas brought his hand back to the table now and left it there, hand opened and relaxed. He reached for the spoon and then began eating his soup. It was good, just as his brother had said. He ate it happily. Cam put down the spoon, letting it sink into what remained of his soup which was about 3/5's full right now. Then he looked at Nicolas, letting a large smile crease across his face. "Way to go, bud. I knew you had it in you even though I've seen reels cast better than that before. Then again, you caught her. Just like that." Cam had a chipper and joking tone as he spoke to his brother, all in good character. "I'm sorry I tripped up over my nerves. That's harder than it looks like it is, Cam. However, I am glad you pushed me to do it and go after her. Thank you, man." "No problem, Nick. Now let us finish up here and we can proceed with the evening?" "As long as you give me a chance to exchange departing words with Erika." "I'd be ashamed of you if you didn't." "Alright then. Let us finish up and continue with our day." "Is there anything I can help you two lovely gentlemen with now?" "Nothing here. I'm just getting ready to leave. Allow you two some time away from my gaze." With that, Cam slipped ten bronze pieces into Erika's hand to pay for both, his and Nicolas', meals. Standing then, and nodding his head to both Erika and Nicolas, Cam left them and proceeded to wait just outside the Inn on his brother. Nicolas then stood up and embraced her in a loving hug, kissing her on the brow as he did so. They swayed from side to side for a moment before Nicolas spoke. "Until our paths next cross?" "Until our paths cross again. Remember me in your travels." With that, Nicolas let go of her and the hug and proceeded to meet up with his brother outside of the Inn. The sun was at its apex and Crom Storm-Heart sat in his customary booth, alone for now, but that would soon change. His people knew he was here, as he always was, for four hours in the middle of the day. He was a Mokh, man and elf might call him a shaman, and he was the only one anywhere near Stonedale. So orcs of all tribes present in this melting pot city came to him for all their needs. A strange twist in the skeins of fate, he thought, that he had become as chief to more orcs than any one clan held after losing his own to minotaurs. He thought about this at length with an amused smile as he smoked his pipe. He snorted when he saw a young man order water for himself and his brother. That snort became a cough and an amused smirk, with some quiet words to himself. "He'll be shitting himself for a weeks, even if he lives. Dumb kid." A young orc-maid, Zala, who worked in the kitchen came out to meet him, carrying his roast pork and quarter keg of ryncol. She smiled a bit timidly but approached him boldly. She was a pretty young thing, though barely a woman and it was his understanding she was a bit taken with him, so he smiled warmly and slipped her a few extra coppers. Young women deserve better than than he could give them in their husbands. She smiled and her cheek flushed slightly and he chuckled to himself as she turned back to the kitchens, he helped himself to a mug of ryncol and gobbet of pork, seeing an armored man walk in followed by several orcs, one a woman and the other her henpecked husband. Gorta and Zok, he had heard rumors of some marital issues, and had expected them to come sooner than they had. The orc community was quite tight knit, even more than a stronghold it often seemed, a way of keeping their identity so far from home. Zok was a laborer and occasional boxer, and Gorta worked in the shaping of leather and metal, as so many orc women did. They were humble, honest folk, and it pleased him to see them. "Kor'dakh Gorta and Zok. It makes my heart glad to see you this fine day. How might I help you?" The couple bowed their heads and touched the bridge of their noses between the eyes, the traditional greeting to a shaman. He bowed his head as well and tapped his chest over his amulet with an open hand, the traditional response to such a greeting, and regarded them carefully. Marital problems were often hard to speak of openly. Gorta wasted no time, practically roaring at Crom. Mokh Crom, We haven't coupled in months! Quiet woman! Why must you carry on so? IN PUBLIC! Ah, that problem, Crom heard it more than one might imagine but he smiled comfortingly and raised a hand to quiet Gorta's ranting, mercifully, she instantly obeyed, bowing her head in apology. "I have heard this problem many times. You are a couple well respected and great in standing among the elder-wed. These difficulties are to be expected. Come, I have a remedy. Sit, have a drink while I prepare it." Crom produced his medicine bag and set up his tools. A mortar and pestle, alembic, a small bit of wolf fang, bear bone, baby's breath, and salamander blood. He added a measure of the ryncol to the alembic and set it to boil. He ground the fang, bone and baby's breath to a fine powder and mixed it thoroughly with the practiced hand of a shaman before adding the salamander blood. The addition of the blood formed the powder to a paste and he carefully scraped the paste into the ryncol in the alembic. The mixture glowed and changed to a marvelous emerald green, and he carefully tipped the alembic so as to pour the potion into a small vial. He stopped the vial with wax, and held it in his hand. His eyes took a sheen as he muttered words to himself, a very subtle glow surrounding him as he channeled magic into the mixture then he handed it to Zok with a smile. "Take this when the sunsets with your evening meal, and your problem shall be remedied. Send the younglings for their lessons at that time, I shall keep them occupied for two hours. You will need no more." Gorta and Zok smiled and thanked him, leaving the tavern in a hurry while Crom smiled and took his drink and pork again. He would have new cubs to teach in a year's time, if he were any judge. Crom attended to the needs of several more of his people. He crafted charms, mixed potions, gave advice and as the afternoon wore on and he saw to all his flock he grew weary. He slipped Zala a few more coppers for her attentive service and gathered his belongings. He leaned heavily on his totem-axe as a wizard might on his staff and put his broad brimmed hat on his head as he walked into the pleasant afternoon air, on his way to his small home in the orc quarter. A large tabby cat lay curled at the edge of the bartop. Normally, Peaches, as the hostess chose to call the cat, would be outside in the presence of company, hunting mice or other vermin numerous about the tavern. But today, today Peaches had had enough of her life of servitude, and was trying her paw at rebellion. She opened one emerald eye to stare at the orc, and then the other to gaze across at the paladin. It had been some time since she had stretched, so she stood, digging dirty claws into the wooden top of the bar and showing the excess skin flaps along her sides. This anatomy meant she was no ordinary cat, but a Flit. Her "owner" came by and shooed Peaches off of the counter. The Flit complied with the command, but not without a half-hearted swipe at the woman's hand in the process. She shook as she landed, erasing the remaining stiffness her nap had left in her muscles. The floor was made of the same rough, thick wood of the bartop, so Peaches kneaded her claws into the soft upper layer continuing to stretch. She bunched her shoulders, made an epic yawn and curled her tail about her hunches as she sat giving everyone in the bar the evil eye. The tail beat lazily across the floor for about a minute as she thought about her next course of action. Surely someone would order food, and surely that someone would drop crumbs. Surely she would not have to go hunt today. It was far to warm outside for it. However, that sunshine looked more than wonderful. A dirt bath could indeed be the answer, followed by another nap. She began to tap a claw upon the wood thinking about the prospects. Peaches flopped into the dirt outside of the Inn rolling and arching her back in the ecstasy that came from a good dirt bath. In an odd catlike way, she smiled. This was a brief upturn of the folds of her jaws with eyes shut tight. If you have a cat, you should know what I'm talking about. She flipped back up on her belly paws out before her and tail lashing excitedly as bright, attentive eyes saw movement just out of the corner. A sound! Her head turned towards it and she gazed intently, unblinkingly at the spot. The back end of her bunched, readying for an epic and powerful pounce on the moving thing. There! The thing twitched again out of the corner of her eye. This time however, she was ready for it, and she sprung forward at it. The leap in itself was quite impressive, since the maybe 20lb cat about 3 feet long from nose to tail, made a perfect parabolic arch that was at least one full body length in height and twice that across from her initial position. She came down with all paws on the culprit, assuring that it would soon cease its movement. Cats always seemed to attack in this manner, to stop a thing moving or making noise or some other annoying nuance, but they seldom took into account the boredom that always ensued after that long and perpetual silence. It was a good thing for short attention spans, and still that Peaches was not an ordinary cat. She found herself atop a very rugged and dusty tri-corner hat, a large feather moving hither and thither whenever the light breeze caught it. Peaches moved her paw again to stop the feather from moving, but the wind constantly caught it so that the pesky thing would not be moving. She sat on the hat, her paws grasping the feather tightly between them, while she gnawed contemplatively on the tip of the feather. After a time, and after much salivating over the feather, Peaches released it and gave it another look. No longer did the wind tickle the feather into movement. The stalks lay in a sticky lump across the quill. Peaches purred with some satisfaction. She sat then upon her hunches, edging them slowly off the hat. Her forepaws held the tri-corner between them now. Softly, with great care, she lifted the hat up a bit to peer beneath it. Sticking her head under it, she released it from her paws atop her head. With a little effort, she raised back up into a sitting position with the hat resting on top of her ears. The heavy leather was warm, but it dulled her hearing a little bit. First she frowned against it (a little droop at the corners of her jaws and a vicious thrash of her tail), but she took a few prances around the alley outside of the inn. After some internal debate, she decided that the hat worked for her. She took a seat once more on her haunches. With a booming purr and a beaming kitty smile, she turned her face into the sun and street, hat atop her tawny, tabby head. Shortly after midnight, a cloaked young man enters the establishment and approaches the counter. He lays down a few coins and gestures to a pot of stew over the fire and to a barrel of ale near the corner. His order, though silent, is quickly filled as is his belly, then in short order he leaves the counter to inspect his room for the night. At least the cot is marginally more comfortable than the ground. He estimates that he has just enough gold to stay in town for a month or so before he'll need to secure another contract, a task that may prove difficult considering his nonexistent reputation in these parts. He removes his equipment and strips down to his pants to sleep, but before reclining he places his stiletto underneath the pillow. Sleep comes easily to those prepared to kill. Animus stirs and pulls himself out of bed. After taking a few minutes to stretch, wash himself and dress, he heads out to begin his search for work. Surely someone in this town could use someone with his....talents. *Off in the corner of the bar sat a lone figure leaning against the wall with the hood of his cloak up. He was watching all that was going on as men and women alike were getting drunk late at night. He too had a drink sitting in front of him but he seemed more interested in what everyone else was doing. Unlike most other people in the bar he had a weapon with him sheathed at his side and hidden under his cloak his entire left arm was covered in armor. Oddly enough if anyone actually had taken a close look at him they would notice several different things about him even though he appeared human. His eyes were an unnatural color which was why he wore a hood and he had sharper teeth than the average human but he wore a cloth over his face normally hid his mouth. "Keep your hands to yourself." *As Draythos sat in his little corner he saw a woman leave the bar and after being knocked over by two people trying to dance while drunk. She seemed alright and had even gotten back up and began to carry her drink away until a man tried to get her dance. Obviously she was the wrong kind of girl to do that too because she quickly hit the man making him let go of her. To his amusement she even dumped the rest of her drink on his head which Draythos could was making the man very angry. I do believe the lady would like to be left alone unless you have a problem with that? *The man even though he had little sense left in his head still new enough not to start a fight which was good for once. So he quickly stumbled off back into the crowd of people an when he was out of sight Draythos turned to look at the girl and this time smiled in a friendly way to her but this time not showing his teeth for a good reason. I'm sorry you had be caught out in all this, would you like me to buy you another drink to replace the one you had lost? "As long as you don't expect me to dance with you..."
Honestly I was expecting a fight. 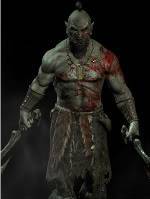 *It was the truth as harsh as it may sound Draythos was fully expecting the man to burst out in anger. He would have preferred it if he had tried to hit him instead of the girl but his reasons for stepping in was purely for a fight. It was an odd thing about him how he always liked to fight more than other people but he was good at it and his reasons for it he kept to himself. "Expecting a fight? Or hoping for one?" *Anven looked away from the what was going on around hi and looked the woman in the eyes as she seemed to have just seen right through him. Yes he had been hoping for a fight he was in a way blood thirsty for battle but in some other ways just always wanting to find someone who could best him in a fight. You could say I was hoping for one though your talking to a warrior here all i do is fight. "What kind of warrior? For hire?" Yes you could say I am a warrior for hire doing the odd job here and there. "Are you on a job now? Are you available? Are you on vacation?" "I have a job to offer you... if you're any good anyway... Interested?" "I need someone to... protect my body.."
Alright if that's all you need then it should be easy enough. Mind telling me what you need protecting from don't tell me the big bad wolf is after you and you are little red riding hood trying to get to her grandmothers house.